Please refer to Copyright Policy as well as the Media Upload Policy for Chrono Wiki. If there are any questions, please direct them into the discussion page. As always, please refer to the Manual of Style when editing. 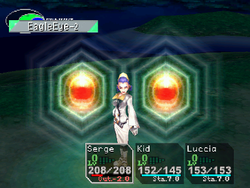 EagleEye is a 4th-level Green Element in Chrono Cross. After assisting the sailors on the S.S. Invincible defeat the Ghost Ship, EagleEye, and several other strong elements, Traps, Buffs and Debuffs are purchasable from the Demi-human merchant in Guldove and the Demi-humans on Marbule. Specifically, EagleEye maximizes a single ally's Hit % rate, regardless of level allocation. Because of this, it is wasteful to set EagleEye and other Buff/Debuff Elements any higher than the level 1 allocation spot. Although this will depict the Element as being -3, no quality difference i depicted; the character with EagleEye cast on them will still receive 99% hit rate for several turns. This Element is especially useful for characters wielding Shots, Boomerangs, and Rods -- such as Luccia, Mel, and Guile respectively. Iridescent lights, varying from green to pink, in the shape of an eye, branch from the target in glorious display. Two fierce red eyes emerge on either side of the target, radiating light in an hexagonal pattern. Eagles are said to have the sharpest vision of all avian creatures. Since this tech increases a character's likelihood of landing several successful hits in a row, and since such a feat relies heavily on accurate vision, this name is appropriate. This page was last edited on 31 July 2011, at 22:36.